Atlanta’s much-maligned reputation as a traffic-clogged, car-dependent city is not without reason, but the vision to for a path and greenspaces for people who live and work in Buckhead is becoming a reality. Buckhead’s PATH400, a 5.2-mile paved urban trail being constructed will connect neighborhoods, offices, retail, and MARTA with a walk or bike ride. The completed path runs along GA 400 from behind Tower Liquors on Piedmont Road to a little beyond Loridans Drive to the Atlanta city line. Feasibility studies are underway to extend Path400 even further, to trails in Sandy Springs and Dunwoody. When all segments are completed, Atlanta will have a 7-mile path from the neighborhoods around the Lindbergh MARTA station to Dunwoody. 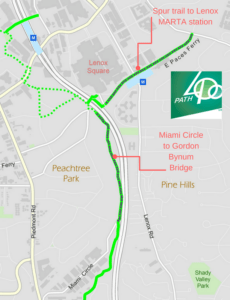 Eventually, Path400 will connect to the Atlanta Beltline. Livable Buckhead is leading the PATH400 project in partnership with the Buckhead Community Improvement District (Buckhead CID) and the PATH Foundation. 2.5 miles are now open, including the two newest segments – between Sidney Marcus Drive and Miami Circle, and between Old Ivy Road and Wieuca Road. Construction on the one-mile segment from Miami Circle to Lenox Square will be completed this year and will link Path400 by a spur trail to the Lenox MARTA station. Not only is it a path for walkers and cyclists, but it also is a connector to numerous greenspace parks and community gardens along the way, including the proposed Park over 400. For access points and parking to Path400 click here. For an interactive map of Path400 click here. The Path400 and urban spaces adjacent to it add vibrancy and livability to the area and provide exciting opportunity for recreation, alternative modes of transportation, neighbor engagement, community gathering spaces and yes, property value growth. The area around it will continue to grow as a desirable place to live. Search for homes near Path 400.